Whereas the English will all rush to the countryside at the sighting of a single sunbeam, Andalucian pilgrims don’t like to picnic on damp grass. And they won’t turn out for a pilgrimage if there’s a few suspicious grey clouds about. So what´s so gruelling and challenging about the San Sebastian? If there’s a patron saint of drunkenness it must surely be Saint Sebastian. Regarded as the patron saint – now I have to be careful here – not, of or for, but against bubonic plague, you’d think he might’ve fallen out of fashion, due to the obvious lack of need for his services in present day Spain. However, despite being famous for being executed by a hail of arrows, round these parts, he is best-known for the yearly drinkathon named in his honour. At the edge of town a wagon train of covered carts and rigs, drawn by mules, horses and tractors, gathers. Decked with paper flowers worked into images of guitars, fruit or whatever takes fancy, they will form the heart of the procession. More traditional wagons sport palm leaves. Disco and flamenco blare from vintage speakers. All have their particular bands of followers. 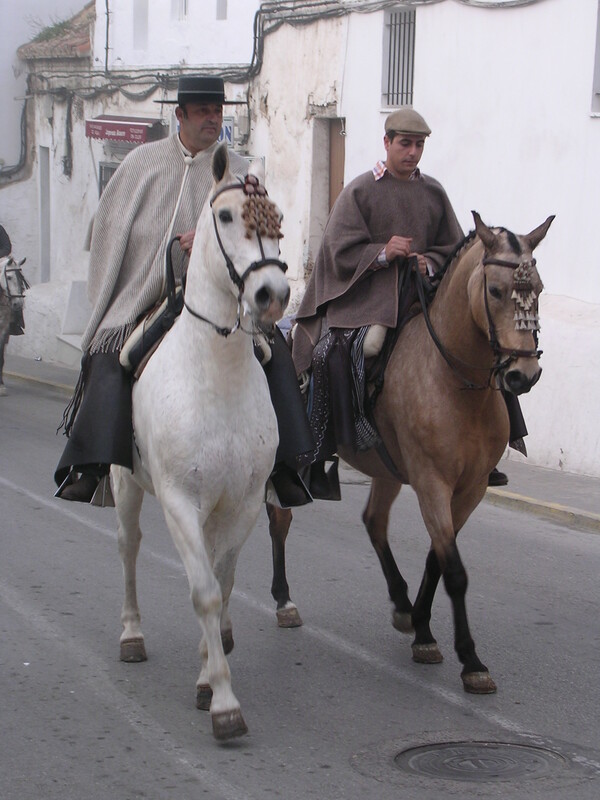 Squirting local white wine fino from goatskin pouches, and swigging from bottles, the main body of pilgrims plods alongside the slow procession. Swigging and squirting, singing and dancing, they pilgrim along to the neighbouring pueblo of El Colorado like an ancient snail. Wealthy pilgrims, and some not so wealthy pilgrims, ride horses, bottles sticking out of saddlebags. 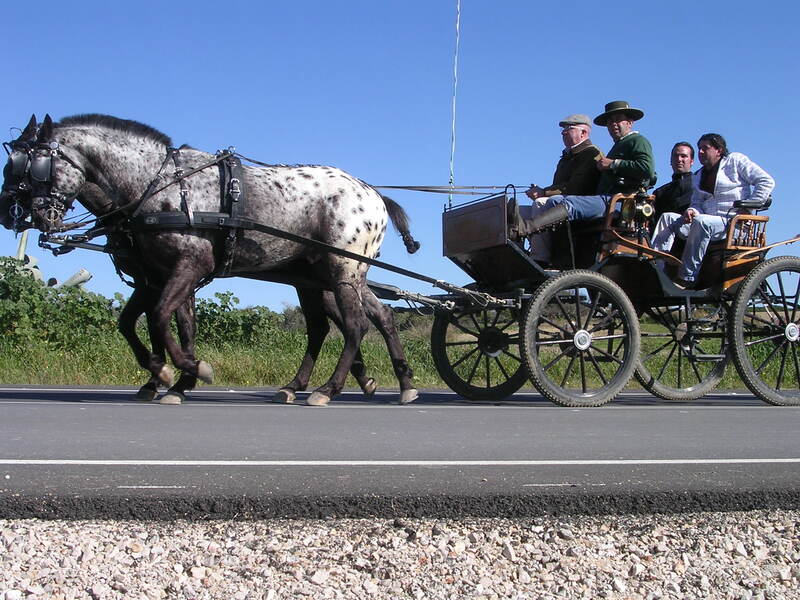 As the wagon train progresses, small children, too tired to walk, and teenagers, too lazy, hitch rides. It takes almost three hours for the first pilgrims to reach the forest lining the approach to El Colorado. Two sheets to the wind, and some showing signs of a totter, they’re greeted by the scent of burning pine. Having driven out earlier, mums, dads, uncles, aunts, grannies and grandads have set up picnic tables and chairs. Barbecues sizzle tuna, prawns, lamb, pork, rabbit; deep pans bubble with bean stews. Bowls of salad and hunks of bread stand by. And fino, always more fino. Now joined by bottles of beer, red wine and spirits. 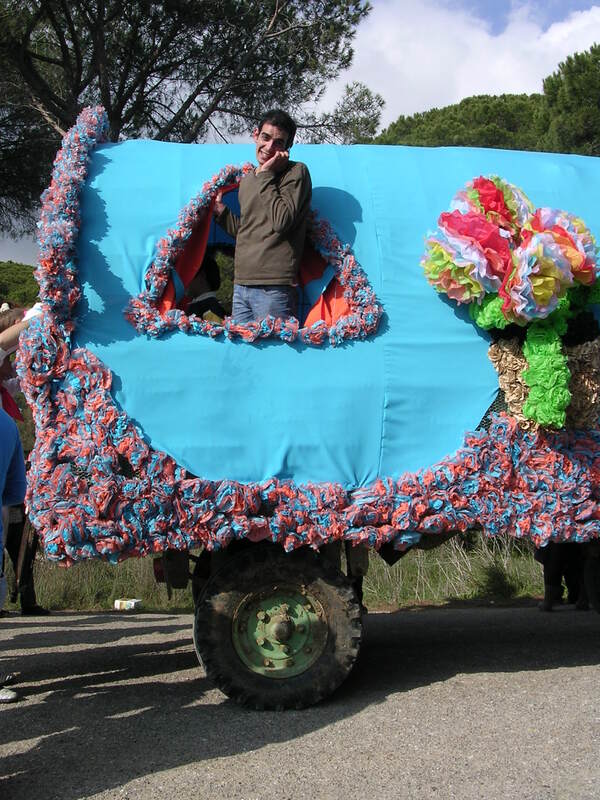 Families with up to ten children or more are still common in this part of the world; they come together for the romería. Witnesses to debauchery, as the evidence staggers by. Past neighbours, new friends, and complete strangers, are invited to join in as they meander, powered by an ocean of alcohol. Glasses of fino, barbecued ribs, chicken stew, it’s hard to refuse the hospitality, and impossible to stay sober. Asking about the origins of the romeria produces a variety of compelling answers. Some say that it has its roots in the old gypsy traditions, others that it began comparatively recently – only 15 or 20 years ago. A tipsy, old pilgrim once told me San Sebastian was gay. Didn’t quite see the relevance. The only openly camp things I’ve seen over the years are the open campfires. Everyone is there for a reason. Most are there to get sozzled. The first wagons reach their destination at around three in the afternoon, having taken five hours to complete the journey. The stragglers are still coming in two or three hours later. For those pilgrims who didn’t get quite enough to eat and drink on the way, bars serving yet more alcohol and food have been erected in El Colorado. Their pilgrimming days largely over, many fishermen have taken the easy way to El Colorado, by car or van. Propping up bars, they knock back glass after glass of fino, the odd sozzled bard singing flamenco to his fellows. The poor sod can hardly be heard for all the deafening loudspeakers blasting hip-hop and rap. Few pilgrims bother to see who wins the prize for best decorated wagon. Both filled with alcohol and drained of sense, they wouldn’t remember, anyhow. That’s not the point for the pilgrims. For those still able, there’s lots more serious eating and drinking to be done. And if you’ve had enough to eat and drink, there are novelty straw hats hanging from stalls piled with cheap jewellery, sweets, candies, toys and knick-knacks to buy. Gypsies stalk the site with bunches of balloons. All the fun of the fairground, without the cost of the rides. There are no rides. 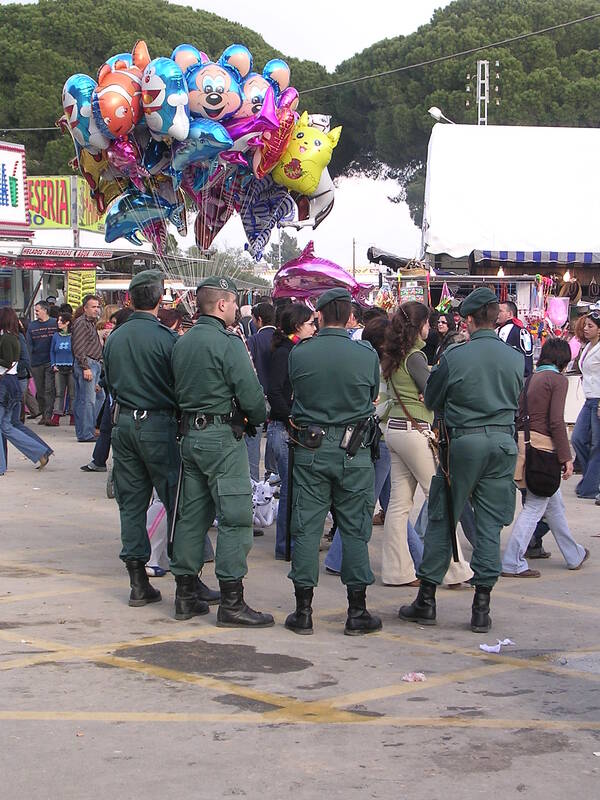 In the unlikely event of pilgrims on the pillage, knots of guardia civil stand idly by. Meanwhile, those that have made it stagger round congratulating each other for hours. And many more hours with many more congratulations will pass before boarding the bus back to Conil. So good you do them twice. Or three times, in some cases. Though on the wane, family traditions are still strong in Andalucia, where parties and fiestas form a large part of life. The generations gather together many times during the year, the romería being just one. And as with most Conil traditions, celebrations go on till midnight and beyond. But there’s always a price to pay for a real good pilgrimage. Come Monday morning, classrooms and workplaces are noticeably thinner, as devout pilgrims nurse blistered feet, bruised ribs, scratched arms and sore heads. Now that’s what I call a real pilgrimage. I thought ‘eat, drink and be merry for tomorrow we die’ was Ephesians rather than Sebastian! p.s.So many posts worth reading and so little time – could you do a resurrection of your faves every now and then so I can catch up? Thanks, Laura. Funny you should say that, I was thinking of doing a bit more resurrecting only last week. I began last year with a third blog. Missives from Santa Catalina, is a series of short stories written in Spain and very loosely based on the area I live. Some of them appeared here for a while until I decided it made more sense to put them together as a collection, as I think are worth a publisher’s interest. I publish about one a week now, or as fast as I can re-edit them, considering I am doing three blogs at the moment. just reading and enjoying ‘the museum’ yesterday – the characters are three-dimensional in a must-be Spanish way as I don’t meet them here..unfortunately. Cunning & widsom rolled into one. Think I’ll print them out for bedtime reading . p.s. do love the illustrations too Angelica’s? I only just realised, after posting my reply, that you already have read some, if not all, of the stories. Still, a bit of extra publicity won’t hurt. Most of the main characters ar based on real people, but sprinkled heavily with a lot of poetic licence. Angelica has done most of the illustrations, while I am responsible for a couple. She’s working like crazy at the moment, as she enjoys being part of my work, as much as I enjoy being part of hers. Bearing in mind resurrections a little more, Laura, I’ve just changed the design of my blog. Although I prefer my former design, the new design makes if far easier to go through all my posts. But there are a few I will re-publish, as I have more readers, and some don’t have the time to look through what I see is a very long list of posts and pages. The new design makes gives a little taste of what to expect. Thanks for the tip, it made me think. But it will take a little time for me to get used to and catch up.